Leading players in the market are focusing on mergers and acquisition, collaboration, and partnership. They are also investing in research and development activities to increase efficiency of these devices. Few other companies are also contributing in growing the global bulk acoustic wave devices market. They are Teledyne Microwave Solutions, Honeywell International, Inc., Kyocera Corporation, API Technologies, and Infineon Technologies AG. 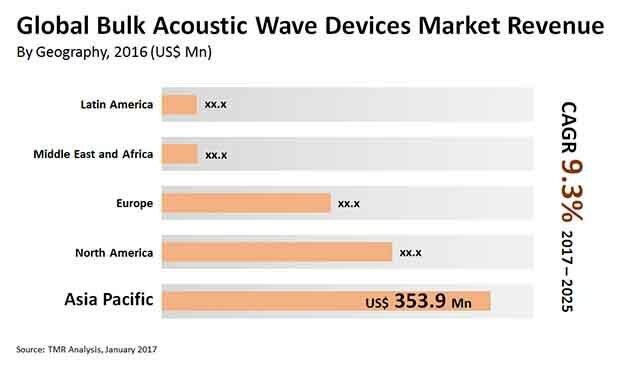 In terms of revenue, the global bilk acoustic wave devices market is expected to touch US$1.869 bn by the end of 2025. In 2016, this market earned US$0.86 bn. these figures are likely to be earned if the market progress at CAGR of 9.3% between 2017 and 2025. Transparency Market Research presents these figures in its report on the global bulk acoustic wave devices market. Among the various devices, the demand for bulk acoustic wave filters seems high in this market. The filters segment earned US$0.51 bn in 2016, and is expected to hold dominant share in the forthcoming years. Bulk acoustic wave filters have a traditional benefit over surface acoustic that expanded its in the global bulk acoustic wave devices market. Based on geography, Asia Pacific is estimated to hold maximum share in the global bulk acoustic wave devices market. Rapid development in telecommunication and electronics industries are supporting growth in Asia Pacific bulk acoustic wave devices market. Significant rise in the demand for smartphones, computers, laptops, and other is one of the major factor driving growth in the global bulk acoustic wave devices market. Increasing use of advanced technologies, shifting focus from 3G to 4G technologies that require high performance filters has encouraged growth in the global bulk acoustic wave devices market. Rising application of bulk acoustic wave devices in various industries such as telecommunication, aerospace and defense, automotive, environment and industrial, healthcare and medical, and consumer electronics has further augmented growth in the global bulk acoustic wave devices market. Adding further, rising demand for connected devices and smart devices such as smartphones, GPS systems, and infotainment systems are also expected to spur demand in this market. There are few concerning factors that need to be managed for the market to grow smoothly. One of the major restraint is related with the use traditional technologies that were used by microwave devices. Use of these technologies limited devices compatibility with other systems. However, this restraint is being covered with newer techniques such as bulk acoustic wave that nowadays used widely. Moreover, rising application of these devices is also expected to further boost growth in the global bulk acoustic wave devices market. The study presented here is based on a report by Transparency Market Research (TMR) titled “Bulk Acoustic Wave Devices Market (Devices - Filters, Resonators, and Transducers; End-use Industry - Aerospace & Defense, Telecommunication, Environmental and Industrial, Automotive, Consumer Electronics, and Healthcare and Medical) - Global Industry Analysis Size Share Growth Trends and Forecast, 2017 - 2025”.